11 Aug Clare gets married. We had a magical day that was everything we had wished for and more. How did you hear about Creatiques? How long have you been planning your wedding for? What was the inspiration behind the style of your wedding? We started with a party to celebrate with our friends and family, once the venue was booked with that in mind we could start work on a garden party theme. The venue and dress were in style with each other, and having entertainment throughout the day was the best decision we made. Why did you choose Creatiques for your wedding dress? I went along to a designer event in 2013, and to be honest I hadn’t planned to be picking anything as I hadn’t really decided on a style, so when Andrew helped me select a variety of dresses I was very surprised not to find a number of dresses that I liked, let alone buy a dress at the event, I even promised my partner that I would only look. But as they say when you find the one you just know, and I did. Not only did I cry when I saw myself in my dress, so did one of the stylists at the event, which made me even more sure that I had to have the dress. The service at the designer event was very personalised and I would recommend going along to one of Creatiques many events. How would you describe the style of service you received from Creatiques? 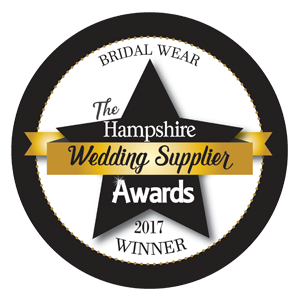 From attending the designer event to the morning of the wedding, the service was outstanding, Rob is very professional and offers a great service on trying your dress on, talking you through the best underwear to buy, offering advice on any alterations, to the preparation of the dress. I felt like I was the only bride to be getting married on the 19th July, although I was one of many! How did your dress feel on the big day? Having only given birth to my daughter 15 weeks before hand, I was very nervous on how I would look on the day, however with my hair done by Andrew, and the dress and jewelry by Rob, I looked amazing and felt like a true princess. If there was one thing that you could have done differently on the day, what was it and why? Not stressed quite so much the day before, everything was perfect! Although a little air conditioning would have made everyone a little cooler on the day! Tips for future brides………. Pick your wedding party well. Pick Bridesmaids that will put you first, and make sure you feel great on the day. Your photographer is a big part of the day, so ensure you like him/her before the day, ours blended in and we have some great pictures to show for it, if possible have 2! Do not have people around you that may stress you out, enjoy your day, and remember that it will go so quickly. We planned a celebration of our love and from the morning of the wedding that is what we had. The sun shone, I married my best friend, in front of my 15 week old daughter, and all our family and friends, and then we partied into the night. The most perfect day.